Fiocchi® High Velocity Loads. Everything a wingshooter needs! And for a truly reasonable price. The definition of "bang for the buck." Featuring high-brass cases, pre-fractured wads that maintain a reliable pattern and some of the best powders available. Shot Size: 5, 6, 7.5, 8. State Shot Size, as available in the Shopping Cart. Fiocchi, 16 Gauge, 2 3/4 1 1/8 ozs., High Velocity Loads, 25 Rounds is rated 4.9 out of 5 by 40. Rated 5 out of 5 by Dave from PERFECT every time! These are exactly what I need for my bird hunts...only shell I use!! 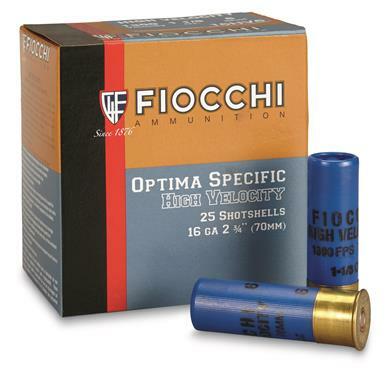 Rated 5 out of 5 by gravy from Great value I like Fiocchi shotshells. Not only are they priced right, they are available in a wide range of sizes. Every bit as good as the American product. Rated 5 out of 5 by JOHN THE FOX from KILLS SQUIRRELS REALLY GOOD! DOESN'T TEAR UP THE MEAT EITHER! THIS LOAD IS PERFECT FOR SQUIRRELS! THE SHOT DOESN'T PENETRATE THE MEAT, UNLESS IT HITS BONE. THE MEAT IS LIKE SHOOTING IT IN THE HEAD. I HAVEN'T FOUND A BETTER LOAD TO USE AND I'VE TRIED SEVERAL. WORKS GOOD ON TURKEY HEADS TOO! Rated 5 out of 5 by hunterbrant from Quality ammo at a reasonable price . Fiocchi produces a quality product. I've purchased both center fire and shotgun ammo in this brand and never had any issues . Always performs as expected . Rated 5 out of 5 by gravy from great ammo 16 gauge is hard to find locally and when it is available, the selection is limited. I find these are a dream come true. I've stocked up on these. I love them and so does my Stevens 5100 double barrel. Rated 5 out of 5 by JOHN THE FOX from THE BEST THERE IS, JUST LIKE TOM BRADY THIS IS THE LEAST EXPENSIVE 16 GAUGE ROUND THAT IS MADE FOR SQUIRREL HUNTING AND IT IS THE BEST PERFORMING ROUND FOR SQUIRREL HUNTING! IT ALSO WORKS GREAT ON TURKEYS AND OTHER SIMILAR GAME ANIMALS. IT IS AN EXCELLENT SELF-DEFENSE ROUND TOO! IN MY REM 1100 FC IT SHOOTS A PERFECT PATTERN! THE SQUIRRELS ARE DEAD AND NOT SHOT UP. TYPICALLY THERE ARE 3-4 PIECES OF SHOT IN THE HEAD AND 1-2 IN THE RIBS. AS LONG AS IT DOESN'T HIT A BONE THE SHOT ON THE REST OF THE SQUIRREL FALLS OUT FROM UNDER THE SKIN WHEN YOU SKIN THE SQUIRREL. THE MEAT IS UNTOUCHED! SPG IS THE CHEAPEST PLACE TO BUY IT! THIS ROUND IS THE PERFECT HUNTING ROUND! Rated 5 out of 5 by Seibdog from Great value I have used this ammo for several years and functions flawlessly out of my Browning Sweet 16. I use these for both Pheasant and Quail.